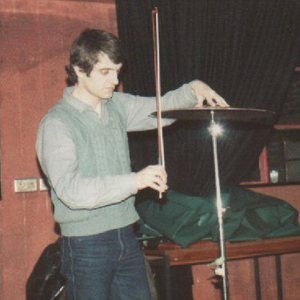 Jackman's earliest known musical activity was as a member of Cornelius Cardew's Scratch Orchestra between 1969 and 1972. He later spoke highly of the value of his experiences in the ensemble, writing in 1994 that "I joined the orchestra in 1969 and soon found myself thrown into an energetic environment where to my surprise my musical ideas, however tentative, would be taken seriously and would actually get realised". In 1979 he began to release very short runs of cassette singles, in line with the prevailing underground culture. These were almost all released under his given name or the moniker Monoplane. It was not until 1983 that he began to use the name Organum and release his work on vinyl on various labels around Europe as well as his own imprint, Aeroplane. He has built an enviable catalogue with many releases remarked upon for their brevity; he has released several one sided 7" singles and many EPs. In a rare interview with US magazine ND (issue 20, 1995), he declared "I don't enjoy lengthy programmes. A 70 minute CD is similar to the old double album. And I never did like that". Despite his relative seclusion, he has used Organum as a platform for many collaborations with contributors including Steven Stapleton of Nurse With Wound, Christoph Heemann, Robert Hampson, Jim O'Rourke, Michael Prime of Morphogenesis, Eddie Pr?vost of AMM, Andrew Chalk, percussionist Z'EV, noise artists The New Blockaders and The Haters, for whom he made a single without the intervention or collaboration of any member of that unit. In fact, Pr?vost, Stapleton and Heemann all released Organum albums on their respective labels with other releases appearing on Touch Records, Robot Records and German label Die Stadt. More recently, he guested with AMM. He is also known for the distinctive artwork which adorns his releases, mostly surreal colourful collages, often meticulous in their detail. However, he has also released some recordings in deliberately spartan or even non-existent artwork - one CD release came in a clear jewel case with no paper parts or other packaging. The official website archives nearly all of this artwork. Jackman continues to work at a prolific rate and to sit outside the experimental music scene.